Niagara College welcomed its first class of future cannabis industry leaders and officially launched its one-of-a-kind Commercial Cannabis Production (Graduate Certificate) program at its Niagara-on-the-Lake campus on September 5. The program is Canada's first postsecondary credential in the production of cannabis and will prepare students for successful careers in the country's rapidly expanding cannabis industry. Classes are held in a purpose-built, fully secure teaching lab at the College's Niagara-on-the-Lake campus. Twenty-four students make up the first cohort, selected from a pool of more than 300 applicants. Students in the program will receive hands-on training in the biology and cultural practices of cannabis production including plant nutrition, environment, lighting, climate control, pest control, and cultivar selection. The program will also equip students to navigate the complex regulatory framework that governs the industry in Canada. Graduates will go on to pursue careers working with licensed producers (LPs) of cannabis as growers, operation managers, and in positions related to quality control and assurance, post-harvest and propagation operation. "The success of our economy locally, provincially and beyond depends on our ability to develop a highly skilled workforce to drive the growth of existing and emerging industries – and that's where colleges play a crucial role," said Niagara College president Dan Patterson. "The emerging cannabis sector is a perfect example of that and our program – Canada's first graduate credential in cannabis production – shows how Niagara College anticipates and responds to needs and trends in industry. We're pleased today to celebrate a pioneering moment for Niagara College, and for postsecondary education in Canada." The introduction of the program is the result of extensive consultation that Niagara College has conducted with LPs over the past several years. That consultation revealed significant and growing demand for highly skilled and expertly trained professionals to lead and navigate Canada's emerging cannabis sector, the college said in a statement. Students in the Commercial Cannabis Production program will also benefit from these strong connections between Niagara College and industry leading licensed producers of cannabis. Since announcing the program, the college has cemented partnerships with several industry leading LPs – partnerships that have opened doors for scholarships and financial supports, as well as internships and work placement opportunities for students. 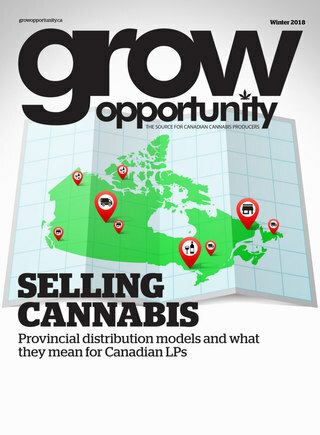 "We're proud to partner with a progressive institution like Niagara College to educate the next wave of industry experts," said Jeff Ryan, vice-president of government and stakeholder relations at Canopy Growth Corp. "As the industry grows, it's important that we hire employees with cannabis-specific knowledge. By partnering with Niagara College, we will be educating the next generation of experts while giving them a head start in a very competitive market through new development and career opportunities." "Strong ties to industry are the hallmark of the applied education that colleges – and Niagara College in particular – provide, and we've been very fortunate to have the support and advice of several licensed producers since we began developing this program," said Vivian Kinnaird, Niagara College's dean of Business, Hospitality and Environment. "We're also very fortunate to have expert faculty who will bring extensive experience from the greenhouse and cannabis industries to our classrooms and labs." At the launch event, guests heard from one of the first students in the program, John Skilnyk, who relocated to Niagara from Dawson City, Yukon. Prior to enrolling at Niagara College, Skilnyk served as Dawson City's chief administrative officer, and boasts more than 20 years of experience in education and administration. "I wanted to shift gears from a traditional office environment and gain some practical, hands-on skills to complement my educational background and work experience," said Skilnyk. "It's exciting to be a part of the first class of such a unique program. I look forward to the opportunity to learn, hands-on in the production of cannabis but also learn about the evolving regulatory environment and the unique business aspects of the industry." Niagara College's Commercial Cannabis Production (Graduate Certificate) program, is open to applicants who possess a diploma or degree in the areas of horticulture, greenhouse technology, agricultural sciences, plant sciences, biology or a related discipline. Visit niagaracollege.ca/ccp for more information.